Nissan dealers in Europe must excel in key customer satisfaction areas to win the right to sell the Leaf full-electric car. Nissan Europe dealers will have to complete a "massive" training program before they start selling the Leaf full-electric car later this year, a top executive said. "The way customers choose this vehicle, finance it, use it, and eventually dispose of it will be very, very different so that will require a lot of training," Simon Thomas, Nissan's head of sales and marketing in Europe, said in an interview. "That is why we are being very focused and deliberate in the dealers that we select." The Leaf is arguably the most daring car in Nissan's history. It will be one of the first mass-market electric vehicles (EVs) offered so interest is high, which means the pressure is on to deliver a product that meets or exceeds customer expectations. Thomas's team will pick dealers with high marks on surveys that measure areas such as employee attitude, overall customer experience and quality of the facility. "I'm assuming and hoping that our criteria will ensure that we get the cream of the crop," Thomas said. Finding the right dealers is just one challenge Nissan faces. "We also have to make sure that the right people buy the EV. Perhaps it doesn't suit everybody's lifestyle," Thomas said. Nissan's U.S. boss says that dealers there also will be careful when picking Leaf buyers. "We may tell the customer, 'Look, you'd be better off buying an Altima or a Sentra because your driving patterns are not ideal for this car," says Carlos Tavares, Nissan's chairman of the Americas. Like Thomas, Tavares says Nissan wants to be crystal-clear with consumers about the Leaf's benefits and limitations. The car's electric motor promises a 160km (100-mile) driving range before its battery pack is drained. Thomas says those logistics will be adequate for most daily driving needs. But for customers who commute long distances every day or who have no home garage where they can install an electric recharger, the Leaf might not be suitable, Tavares says. "We want to be transparent," Tavares says. "It is fundamental for us to tell the customer what the car can deliver." Thomas said it would be up to the dealer to make sure potential customers know that they are not just buying a car with an electric motor. "We need to make sure that dealers are consultative in the selling process," Thomas said. "There will be anxieties that the customer has. There will be questions the customer has that perhaps don't make sense initially, but we will have to address (them) in the purchase process." Nissan's first Leaf dealers will be in the UK, Ireland, Monaco, Spain, Portugal and Denmark. More markets will get the car later. The first six markets were chosen because they offer incentives -- such as a 5,000 euro (about $6,490) subsidy in Ireland -- that will reduce the compact hatchback's starting price, which has not been announced for Europe. Nissan says the Leaf will cost $32,780 before incentives in the United States, where the automaker says it is on track to book more than 25,000 orders for the battery-powered five-seat car that offers has an 80 kilowatt hour electric motor that helps push the car to a top speed of 140kph (about 90 mph). European orders have not started yet but sales are scheduled to start before the end of the year. 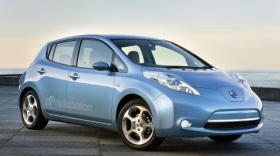 Nissan will start building the Leaf at its plant in Sunderland, England, in 2013. To get ready for that, the automaker began construction April 27 on a new plant in Sunderland that will produce lithium-ion batteries for Nissan's and French alliance partner Renault's electric vehicles. The facility will start battery production in early 2012 and have an initial annual production capacity of 60,000 units. Nissan and Renault also will make batteries at plants in Cacia, Portugal, and Flins, France. 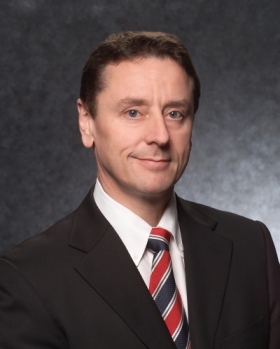 Nissan's Thomas sees a chance that EVs account for 10% of Nissan's total global sales by 2015. Looking ahead, Thomas says that for the next five years the number of Leafs sold worldwide will not be determined by demand. "Basically it's the production guys who'll be deciding how many we'll be selling in the next five years," Thomas said. "The demand side and the supply side possibly could start to reach some sort of equilibrium by maybe 2015." By that time Thomas said EVs could be a key part of Nissan's portfolio: "It's our view that, and this is guessing, maybe one in 10 of the cars that we sell in 2015 might be an EV."